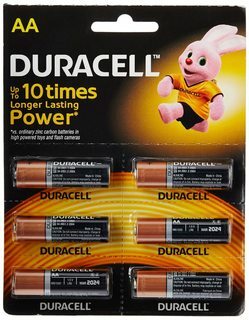 Do Duracell batteries last longer than normal batteries? 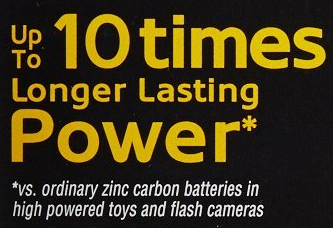 Do Duracell batteries last longer than Zinc Carbon batteries? If so, how much of the ten times part is true? Zinc-Carbon and Alkaline batteries are different battery types. The have a similar voltage and come packaged identically, however the amount of stored energy varies greatly. As you can see, alkaline batteries, such as Duracell, can store up to 5 times more energy in the same volume. However, alkaline batteries also have a better energy efficiency, up to 85% against up to 60% (i.e. a difference is what percentage of the energy in the battery can actually be used). Alkaline batteries also self-discharge twice as slowly as zinc-carbon ones. All these factors are what probably justifies the claim by Duracell -- that said, I've found no evidence that Duracell batteries are any better than other brand alkaline batteries, which is what the claim seems to imply, but not say outright. Not really. The trick they use is to compare to zinc-carbon batteries, which as Sklivvz points out in their answer are approaching 10x worse. Higher discharge currents magnify the effect, but it also very much depends on the device as some can work with lower voltages than others. Note the discharge curves at various loads are almost identical. Duracell has no advantage at all, and in fact performs slightly worse under heavy load. The other issue is quality, and Panasonic are popular with industrial applications due to their high reliability and consistency, where as Duracell are more of a consumer oriented brand. Unfortunately I was unable to find a datasheet for IKEA or another cheap brand of alkaline cell, but but in informal tests (http://www.batteryshowdown.com/static/images/mah_large_200mA.png) they tend to perform similarly to Duracell's most expensive cells at a small fraction of the cost, sometimes as little as 1/10th the retail price. In short, Duracell's claims seem to be from a time when alkaline cells were new and much more expensive than zinc, but nowadays are simply misleading due to alkaline cells being barely more expensive (5-10%) and what consumers are likely comparing against. Not the answer you're looking for? Browse other questions tagged consumer-products chemistry energy . Can you recharge non-rechargeable alkaline batteries? Can a dead mouse sealed in a can of soda dissolve into a jelly-like substance in one year? Do CFL light bulbs last >8 times as long as incandescents? Do airplanes release biological or chemical agents, forming trails? Do lithium ion batteries double effective performance every 18 month similar to Moore's law? Does The LEGO Group produce more tires than any other tire manufacturer? Do “License Plate Blockers” work? Is there any scientific basis to this “catalytic converter” to treat hard water? Is the majority of milk in industrialized countries obtained from pregnant cows? Do windmills take more energy to build than they could produce?